A monument of Paneuropean importance, since it is here that the Latin Nobles who were killed at the naval battle of Nafpaktos ( 1571 ), were buried; this naval battle was the end of the marine threat of the Turks. A few years later the Turks will no longer constitute a threat for the land, either, and the effort of the Turks to expand to the West will come to a final end . Europeans no longer consider it to be an exotic destination, however it continues to be one of the most fascinating places in Europe. It offers an impressively varied flora, desert beaches, crystal water, narrow paths through thick, perennial olive trees , Byzantine churches , medieval villages, traditional Greek taverna's (small restaurants) as well as modern accommodation and amusement facilities. Corfu is a place which refreshes the mind and reactivates the human senses. Daily flights to and from Athens, lasting approximately 45 minutes. Flights to and from Thessaloniki, as well as connection with the other Ionian islands. Connection with several European cities with direct charter flights. The airport is approximately 2 kilometres from Corfu town. Flights to and from Ioannina, Patra, other Ionian islands. Flights to and from Paxos. By the buses of Paxos KTEL, which connect Corfu on a daily basis to Athens, Patra, Thessaloniki and other places in Greece. The KTEL buses work on a structured network and serve the local transportation needs in the islands of Corfu and Paxos. 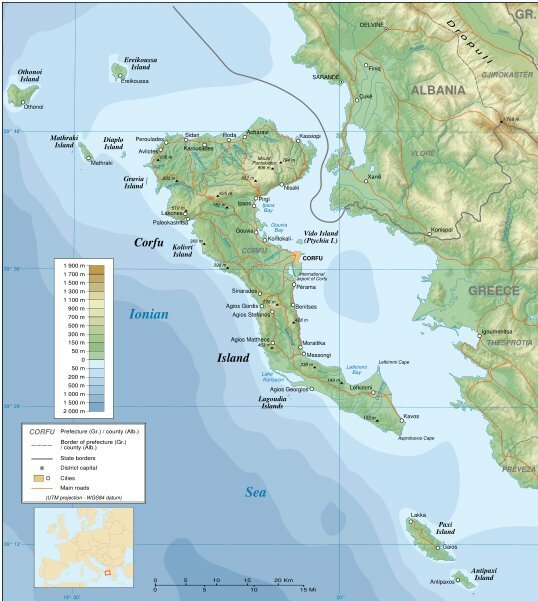 Connection of Corfu to Igoumenitsa, Patra, Saradje Bari, Brintisi, Ancona, Venice. 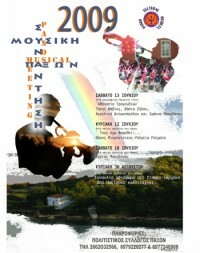 You can also moor off at Benitses Marina , which is situated not far from Corfu town. Corfu , Paxos as well as Othoni, Erikousa and Mathraki are tourist destinations famous worldwide from the late 18th century. This has resulted in,the islands of the region , having large-scale tourism infrastructure of all kinds, of every quality and cost . Following, you will find information on infrastructure for accommodation and services. If you seek to experiencee the magic of Corfu don't foget to visit some of its villages . On foot, on horseback, by bike, by motorbike or by car, leave the crowded beaches behind you for a while and indulge in genuine Corfu. In turn, it Corfu knows very well how to reward its lovers . 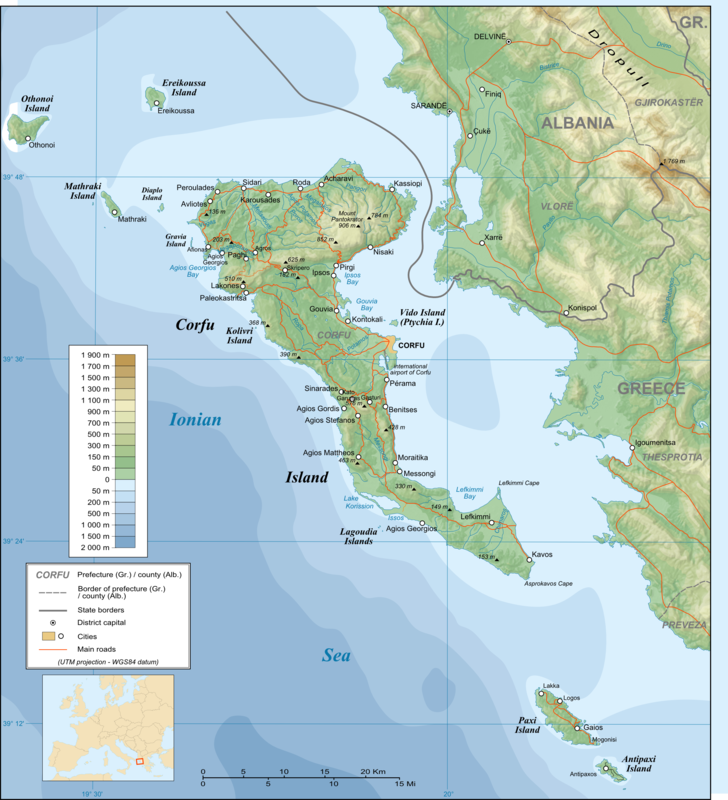 There are more than 100 villages and estates in the green environment of Corfu Paxoi Othonoi, Erikousa and Mathraki . Their character varies, according to their era of habitation. They can refer to the Byzantine era , to the Venetian era as well as to the popular architecture of the 18th, 19th and 20th centuries, while there can also be found traces of ancient or Roman era . There are large villages, small fishermen's villages, settlements of immigrants or local residents with golden seals of Byzantine Emperors and Despotes. Centers of old powerful families or shelters of desperate bread-winners, the villages and settlements of Corfu have old stories to tell you , with pirates , publicans , rulers and slaves, conquerors and saviours, mortals and immortals . The stone-made houses , the traditional square with the coffee shops , the neat churches , but mostly the hospitable, sweet people will enchant you and will make you feel at home . The wider region of Corfu (Corfu, Paxos, Othoni, Erikousa , Mathraki) is a sight , a living museum of history, culture and nature . A piece of history traveling in the sea. No matter where you turn, you are bound to see images whose origins can be traced in old times . History , culture and traditions are carefully kept in museums and well cared for collections . Rare and original exhibits , traces and leads of a distant voyage through time , are preserved with respect and moments of the past come back to life before the eyes of the visitor . Downtown Corfu you will find important museums ; the historic center of Corfu was declared one of the UNESCO Monuments of World Cultural Heritage in the summer 2007 and is itself the most important sight of the island. The past of Corfu is right here, before your eyes, at the city palace, , the two fortresses ,on traditional buildings and mansions , very easily accessible and evident . The richest historical collection is at the Archaeological Museum , where the predominant exhibit is the stunning 6th century BC Gorgo gable. The Museum of Far Eastern Art , the only one of its kind in Greece and one of the finest in Europe is housed in the Palace of Saints Michael and George, and constitutes the most important monument of the period of the British rule. An Orthodox church of the 15th century, dedicated to Virgin Mary Antivouniotissa , has been turned into a Museum, to house the religious expression of the Byzantine tradition , combined with the influence from the west. A little after that, there is the house of Dionysios Solomos, National Poet of Greece, and it is home to the museum bearing his name, as well as to the significant Corfu Studies Society. The historic building of the Ionic Bank has been home, since 1981, of the Banknote Museum, unique for Greece and one of the most interesting worldwide . The hacienda of Mon Repos , in the splendid park of Palaiopolis , houses part of the Archaeological Museum with exhibits from the ancient town of Corfu. In the villages and the nearby islands you will visit museums which present the history, the people, the popular art, customs and traditions of the places. The Historic Folklore Museum of Messi is housed in a well preserved 19th century cottage and it contains really rich collections of traditional clothes from Corfu, everyday life items, tools, cooking utensils, and home and professional items( Sinarades ). The Olives Museum is housed in a perfectly preserved oil mill of the early 20th century, and it displays a rich collection of tools and means for the elaboration of oils and the extraction of olive oil( Kinopiastes ). The Kapodistrias Museum , with an exhibition of personal items of Ioannis Kapodistrias, a Minister of the Ionian State, the first autonomous State to be founded on Greek territory , Foreign Affairs Minister of Russia , one of the main contributors to the Swiss Constitution and the first Governor of Greece( Evropouli ). At Benitses village, a few km outside Corfu town, there is the Sea Museum , which displays the wealth of the sea . The Folk Museum of Paxos displays a local house and really interesting exhibits, that portray the living conditions in a local house during the past centuries( Gai, Paxos ).